Fancy a spa, perhaps a pool, but cannot decide whether to cover it or not, well you are not alone. Mr & Mrs Kennedy had exactly the same problem. He wanted an indoor pool; she wanted an outside one, yet they both wanted an enclosed spa. It was only when they discovered Solardome® glasshouse Industries, a Southampton Firm, that they solved their problem and came up with the ideal compromise – a combination Solardome glasshouse 3 (19’6″). Including an inground spa, half a pool with a unique channel to the outside pool and an attractive and versatile sunroom. They use their enclosed pool all year round but still enjoy having an outdoor pool on the hot summer days. Their spa gets used all year round, especially at night as they can gaze at the stars but still enjoy the warmth of being enclosed. They grow banana plants and other tropical plants and enjoy sitting in the dome on the chilly days. Director of Solardome® glasshouse, Bruce Cowan, explains that the Geodesic dome construction makes it the perfect pool cover or conservatory for the 21st century because it will withstand the climate changes that makes our weather subject to more extremes of wind, rain and sunshine. The shape ensures it is the strongest and most robust design available, able to withstand the heaviest gales, or lying snow conditions. Most importantly the domes are also maintenance free. Solardome glasshouse come in five sizes ranging from Solardome® glasshouse 1A (12′ 6”) up to the Solardome® glasshouse 4B (25′) diameter. 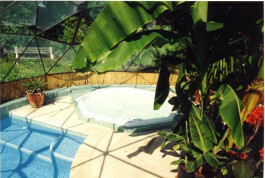 All Domes can accommodate a spa pool and the Solardome® glasshouse 3B (20′) upwards can easily cover a medium sized pool.